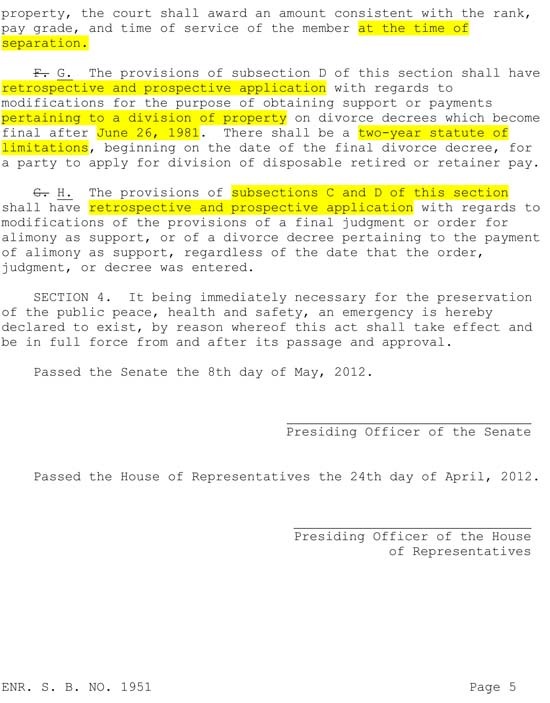 OK Senate Bill 1951 has been sent on May 9, 2012, to the Oklahoma Governor for signature. We’ve already discussed the questionable two year statute of limitation USFSPA language, which in fact was deleted out of other USFSPA related bills, see: OK SB1887 and HB2286. The two year statute of limitations language left inside OK SB1951 will raise questions concerning state vs federal law. One complaint often heard from service members is too much money is spent on military divorce attorneys who must interpret and apply the USFSPA related laws. We would hope that any new law would make things simpler for the service member and former military spouse to understand and reduce the financial burden of divorce. 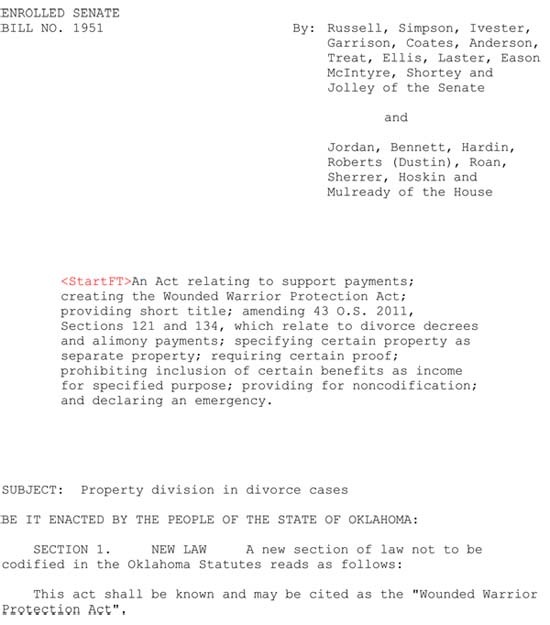 The Wounded Warrior Protection Act, OK SB1951, appears to be aimed at protecting military pay related to service injury from computations of alimony. It has language concerning Special Monthly Compensation (SMC) and Combat Related Special Compensation (CRSC). However, Senate Bill 1951, Section 3, Subsection F, contains language dividing retirement pay as of date of separation. This is not favorable to the soon-to-be former military spouse. Why should division of retirement pay cease upon separation when other spouse benefits continue? Medical, commissary use, and all dependent related pay continues despite separation. Other property assets like growing investments, property growth, etc. do not freeze upon separation, so why freeze the division of pay? 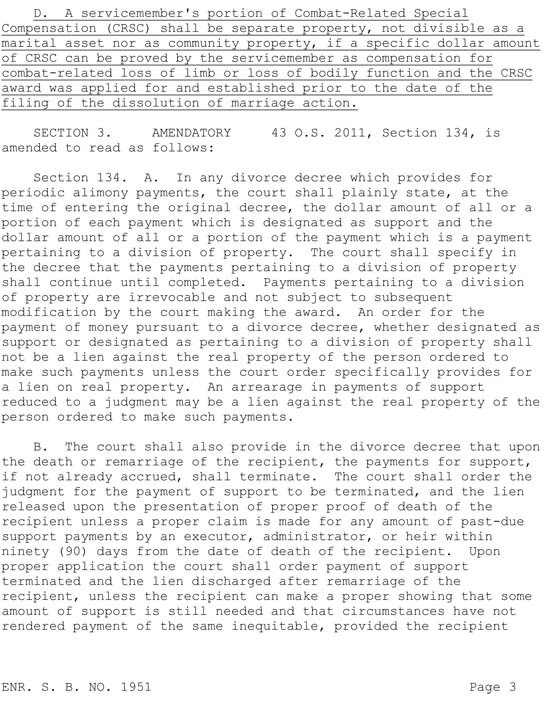 Why is division of property language in the alimony bill? Is Oklahoma saying that this figure based on rank, pay grade, and time of service at separation — will only be used for alimony computation ? What’s your interpretation of the Wounded Warrior Protection Act – Section 3 Subsection G and H? New laws should help clarify and create less confusion in a military divorce. 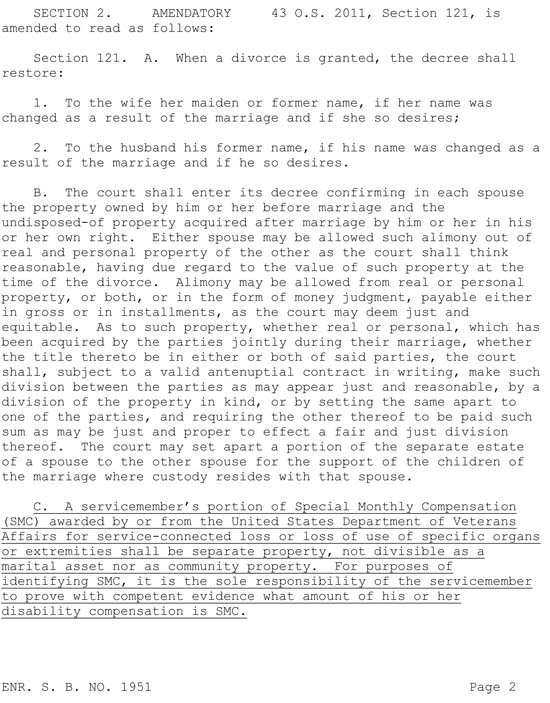 Oklahoma SB1951 Section 3, Subsection G and H refer to the same section (Section 3), Subsection C and D.
Read Subsections G and H below and tell me your viewpoint. Does Subsection G, that applies to D and uses the retrospective date of 1981, override the prospective application declared in D? 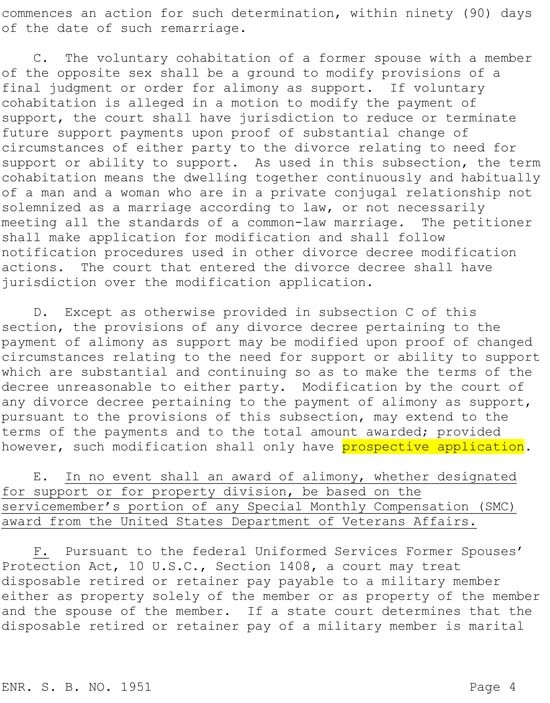 Same question for Subsection H, which also declares retrospective application for Subsection D.
Since Subsection H also applies retrospective to C, will former military spouses who are in cohabitation have to repay alimony received since cohabitation began? How are retrospective actions concerning alimony fair to the former military spouse who accepted alimony instead of receipt of a division of military retired pay? Is the law simple, clear, and will it reduce time and money spent on lawyers? Would you like a similar bill with retrospective language to be passed in the state that holds jurisdiction over your decree? Should Oklahoma’s Governor sign this bill? Do you think Oklahoma’s Governor can understand this bill? What’s your interpretation of the wording in Subsections G and H?